An injury that forced Dominick Cruz out of UFC 148 has opened the door for a new contender to step in and face Urijah Faber for an interim title on July 7. 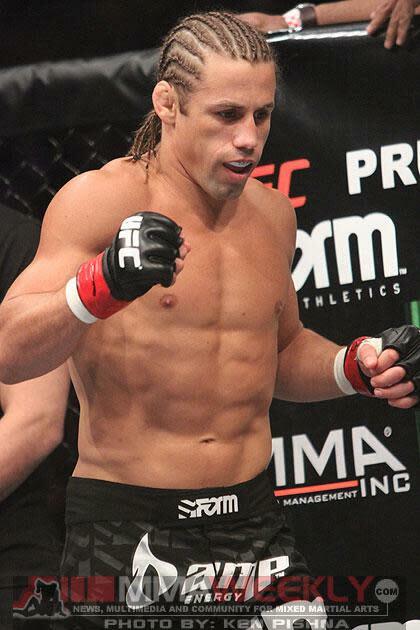 The UFC has decided to make a call to Renan Barão to be Faber's opponent. Barão is fresh off of a decision victory over perennial contender Scott Jorgensen at UFC 143. The UFC made the announcement during Friday's episode of The Ultimate Fighter Live. The Brazilian fighter is 28-1, having only lost in the very first bout of his professional career. He has reeled off five consecutive victories under Zuffa's employment in the WEC and UFC combined. Barão was originally slated to face Ivan Menjivar at UFC 148, but will now get the bump up to face Faber for the interim title instead. No new opponent has been announced yet for Menjivar, but it would seem a likely fit for Michael McDonald to step in to fill the void, as Barão, Menjivar, and McDonald were the three leading candidates to face Faber. Faber vs. Barão will be a five-round fight to determine a new interim bantamweight champion, while Dominick Cruz undergoes and recovers from knee surgery to repair a torn ACL.